A Makeup & Beauty Blog – Lipglossiping » Blog Archive Nails Inc. launches the Green Queen Manicure. Feeling arty? DIY it! Nails Inc. launches the Green Queen Manicure. Feeling arty? DIY it! Keeping up with the latest trends in the fast-moving world of many manicures can be pretty hard work! In light of this, Nails Inc have recently launched their Guest Manicure initiative which allows you to get to grips with a new nail trend for just £15, available from Nails Inc bars across the country. This month sees the launch of the Green Queen manicure, a nod to the colour of the season, worn in a slightly more demure way than going all out HULK on your tips. 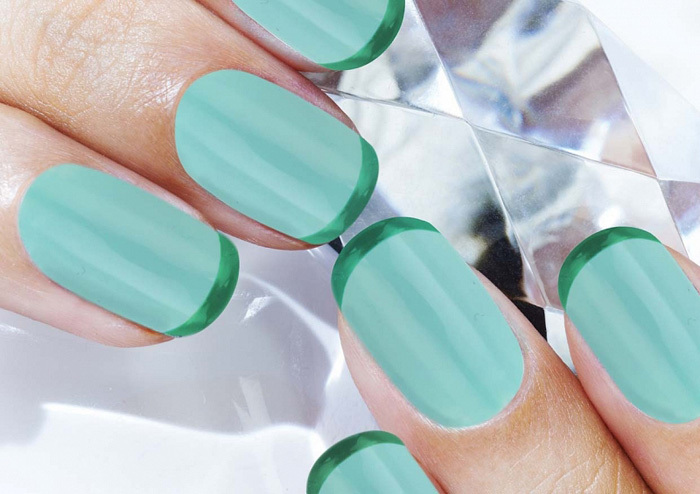 Nails Inc. say: This is the Queen of all manicures for the festival season – a base of Royal Botanical Gardens in mint with with stunning emerald green Queen Victoria Street tips. This is a subtle look to make your nails pop all festival long. It’s the perfect way to accessorise your outfit – through rain, mudslides, thunder or sunshine, whatever the weather throws at us this summer, your nails will be bold, beautiful and bursting with colour. I say… this one’s a bit manageable innit! For once, will I be on trend? Grabbing the closest colours I could muster, I did a pretty neat job (even if I do say so myself). Not got the time for such frivolities? Your life is undoubtedly more exciting than mine… perhaps you’re off to Glastonbury this week to sample the delights of the long-drops and the she-pees. In that case, skip the am-drams and get a pro to sort you out. So pretty!! I love it!! Deal Alert: 500 Boots Points (worth a fiver) for a £1 spend!